One of my talented artist friends said that this may be the most beautiful of the ones she has seen. After all of the years of making them I have never seen this kind of coloration in an agave. I found it on a camping trip in an area far from where I usually collect. The agaves looked to be the same species but there must have been something environmental or perhaps cross pollination of different species to create this unique flower. Along both sides is a purple streak that runs the length of the stalk with many shades within the streak. 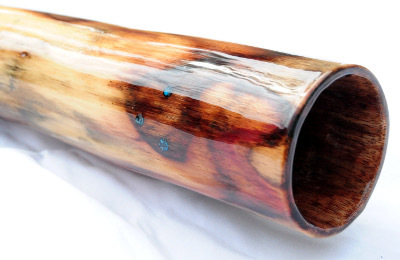 It is complimented by very light wood that pops these colors and turquoise inlaid as well. 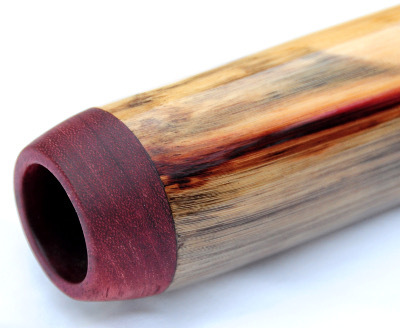 I chose purpleheart as the mouthpiece as it matches it so well. Ok, enough about its physical beauty . This one is extremely sensitive to any slight movement. It takes so little breath and less is more with this one. Three easy overtones with its longer thinner bore. Nice rich bass tones in the drone and crystal clear vocals. One other interesting fact is that purple is the color associated with the crown chakra which is the key that this one is in. Seems it was meant to be. A truly unique agave didge! !